Thumbnails for images and videos not showing in Windows 10 File Explorer? Here you will find a few easy, quick, and safe solutions. 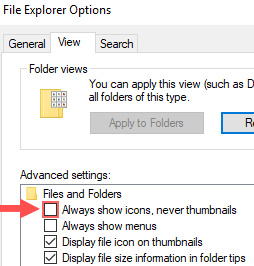 When you open a folder with photos or video files in Microsoft Windows 10 File Explorer, you will normally see thumbnails (reduced-size versions of photos or videos). Thumbnails will appear for almost all common video formats (e.g., MP4, AVI, MKV, WMV, FLV, MPG, and MOV) and image formats (e.g., JPG (JPEG), PNG, GIF, and PNG). If you only see default icons (e.g., VLC icons) and no thumbnail previews, then you can try the solutions on this page to fix the problem. The following solutions are from other websites, forums, and user comments. First, you will have to make sure that the right “View” mode is turned on for the folder that contains your photos or videos or both. 2. Open the folder that contains your pictures or video files or both. 3. Click on View located in the top left menu. 2. Click on File located at the top left. 3. 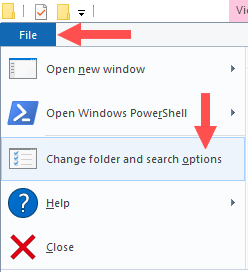 Click on Change folder and search options. 5. Uncheck the Always show icons, Never thumbnails. 4. Click on the Restore Defaults button. 5. Click on the View tab. 6. Click on the Restore Defaults button. 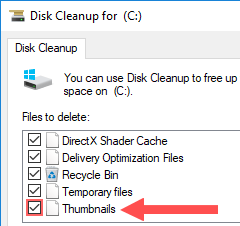 Type disk cleanup into the Windows search bar and click on it when it appears. 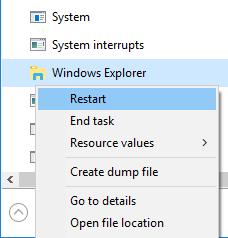 Press the [Windows] + [R] keys to open the Run dialog, type cleanmgr and then press [Enter]. Click on the start menu button, scroll down and click on Windows Administrative Tools and then click on Disk Cleanup. 2. Select your system drive (the drive where Windows 10 is installed). Windows will now calculate how much space you will be able to free on your system drive. 4. Make sure that the checkbox next to Thumbnails is checked (ticked). Windows will automatically generate new thumbnails when required. The following solution is from a comment on another website. When your system drive (the drive where Windows 10 is installed) becomes full, Windows will stop generating thumbnails. Check the disk space of your system drive (usually the (C:) drive) and when it's almost full, then delete or move things from your system drive. When it reaches a minimum of 1 GB remaining disk space, the thumbnails probably show up again. If this solution doesn't work the first time, then try it at least three times. 1. Open Advanced system settings. Press the [Windows] + [Pause] keys at the same time and then click on Advanced system settings (left side). Type advanced system settings in the Windows search bar and then click on View advanced system settings when it appears. Open Control Panel, click on System and Security, click on System, and then click on Advanced system settings (left side). 2. At Performance, you click on the Settings button. 3. Make sure that the checkbox next to Show thumbnails instead of icons is checked. If it's not checked, then check it, click on Apply and then click on OK.
3. Check the checkbox next to Save taskbar thumbnail previews. System File Checker (SFC) is a utility in Windows that allows users to scan for corruptions in Windows system files and restore corrupted files. The system file checker will scan all protected system files, and replace corrupted files with a cached copy. If the System File Checker tool finds corrupted files but is unable to fix them, then visit the following page: How to Solve “SFC Unable to Fix Corrupt Files” Problem in Windows 10. Icaros is a free program that can generate thumbnails for almost all video and image file types. You can download Icaros here. 2. Make sure that THUMBNAILING is activated. 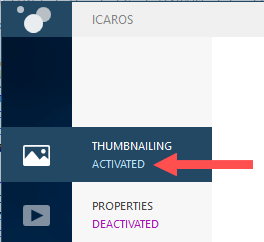 If thumbnailing is deactivated, then click on it to activate. 3. Select an option (e.g., MOST KNOWN) at THUMBNAIL FILETYPES and PRESET.